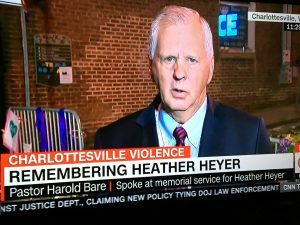 Dr. Harold Bare, pastor of the Covenant Church in Charlottesville, Virginia, the city where racial violence occurred over the weekend, spoke on Wednesday at the memorial service for Heather Hyer, who died when a self-proclaimed white supremacist rammed his car into a crowd of protesters. 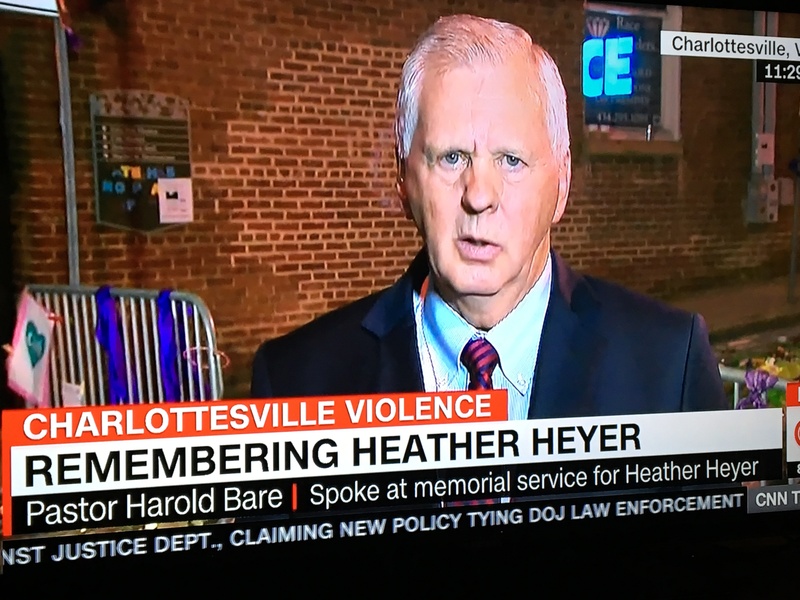 Pastor Harold Bare was interviewed on CNN on Wednesday, August 16 following his address during Heyer’s memorial service. A Memorial Service serves two purposes: First, to appreciate and cherish memories of a loved one. Second, to consider the value added to us for our journey ahead. Matthew 6:9 teaches us to pray. The disciples said…that we may know how to live on earth and prepare to live with God is eternity. Jesus answered: Our Father Which art in Heaven. Hallowed would be thy Name. Thy Kingdom come, Thy will be done, on Earth as it is in Heaven. May this prayer be effected in our hearts. Beginning today. Context is important. 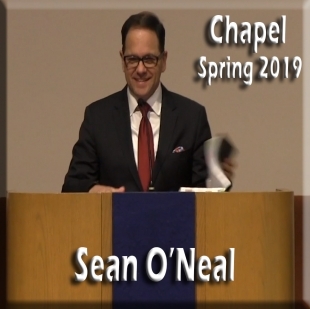 I am a pastor of 36 years in this City. Heather visited Covenant Church several times and was impressed with the diversity of Covenant. Heather’s mom, Susan, asked that my comments address diversity. Please allow my brief comments to focus on what Heather saw at Covenant Church. 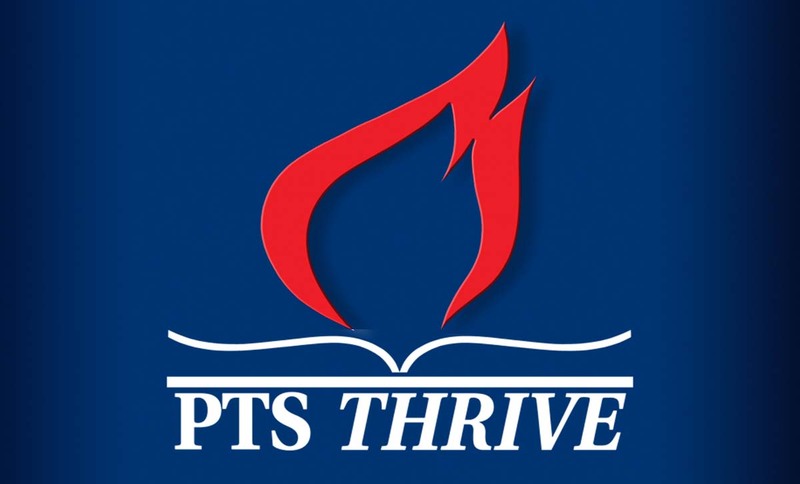 My role in this community was initially as a sociology doctoral student at UVA. 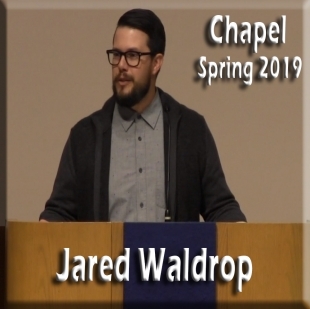 Becoming a pastor was a great surprise to Laila and me. 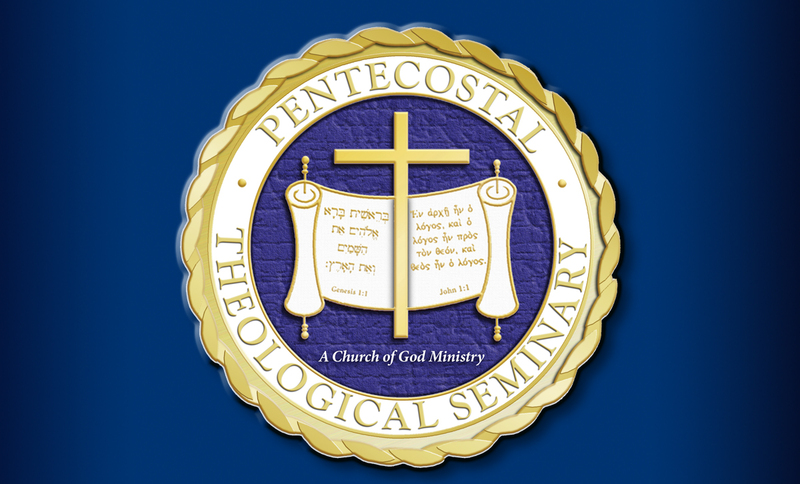 Our congregation was of modest size and all one color. I came to the conclusion that Jesus was the greatest sociologist of all time. He understood social movements, small groups, cultures and diversity. My decision was to implement the teachings of Jesus. 3. When hearing a matter make no judgment until hearing the opposing side (Proverbs 18:17). 6. Remember that the cross is common ground where our rights are surrendered to serve God and others. Currently 76 flags are displayed in our sanctuary to represent countries of persons who attend, have attended or missionaries who have been with us in worship and that we support. This is the diversity Heather saw at Covenant. Can you imagine a person arriving at one of our wonderful world-class hospitals in Charlottesville and needing plasma or a heart transplant and asking “Who is the donor”? Can you imagine having a brain tumor and getting to the hospital and choosing a surgeon based on skin color or culture? Jesus practiced diversity. He chose a motley crew of disciples extremely different in personality, giftedness and skills. Yet he molded them into a formidable force to carry on Kingdom work. My prayer is that this moment of sadness may bring us to a higher appreciation of our need for each other. May the God who made us transform us into servants with humility to not only give of our best to the Master, but to each other. May diversity be defined in relation to Jesus and His teachings. As for me and my house our best service to you, our city, our nation and our world is to share the love of Jesus with others— regardless of whether they look, talk, dress, act or eat the same food we do. Peace to you thru Our Lord Jesus Christ. This is the diversity Heather experienced at Covenant Church. Thank you, Susan, for asking me to speak. Bare spoke live on several media outlets following the memorial, including BBC and CNN. Bare was guest on the Wednesday night 11:00 p.m. segment of CNN’s program with host, Don Lemon.